Never thought I'd see the day where I try out a Shaving Balm for men I mean, I'll use my boyfriends Nivea Face Wash if I stay at his but other then that I stick to my own facial products. 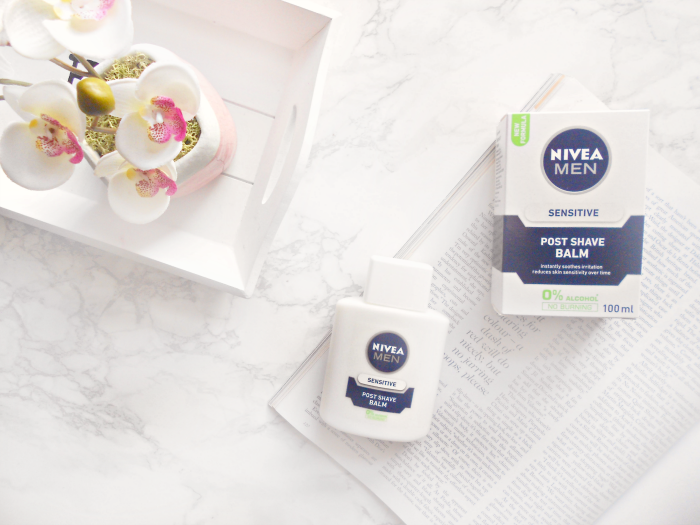 After reading so many great reviews on Nivea Men's Shaving Balm for keeping your makeup in place all day as a primer, I finally decided to see what the hype was about and put this balm to the test. I haven't grown a beard, yet. You can pick this balm up pretty much in any drugstore or supermarket for around five pounds so not at all expensive or difficult to find. I decided to trial this product out on a day I was off from work but still went out as I wasn't sure how my skin would react to it. Once moisturized, I went ahead and applied this all over my face and down my neck. It has a creamy white, almost runny consistency and the scent isn't the best, it definitely has that manly scent to it which I'd usually like but it also smelt a little bit sickly as well. It blended into my skin very quickly and didn't leave me with any sticky or tacky finish which I was expecting. It doesn't reduce the appearance of imperfections or pores like most of my primers do so I was sceptical on how my makeup was going to look during the day. I went ahead and applied the rest of my makeup and I must admit my foundation glided on so much nicer and effortlessly than normal. When all my makeup was applied I did notice my skin had a little bit of a healthy glow to it, I have oily skin anyways but this balm gave me a little healthy glow where the sun naturally hits my face. Once ready I went out and got on with my day keeping a tab on how my makeup was holding up throughout. Once I checked my makeup I noticed my face looked a lot more dewy than normal. Usually, I go all matte with my makeup but this balm has definitely made me think twice on embracing more of an oily, dewy look. I really like how my makeup has that healthy glow to it. However, it did feel as though it would get a little bit shinier during the day so I popped a bit of powder onto my forehead and chin. By this point, I did notice the tip of my nose was starting to melt, but this was the only area on my face that looked as though it was melting off. Therefore this could have been my own fault not the balm as I may have missed applying it to the tip of my nose as everywhere else looked fine. As I was taking my makeup off I definitely noticed my makeup was still pretty much in place and nothing had budged since the last time I checked. I am really quite impressed with how this product has turned out. However, I did find once I removed my makeup my skin felt a little bit greasy so I am worried that maybe this could make my skin more oily if I was to use it all the time and maybe even spotty. Overall though I am really impressed with this balm it definitely kept my makeup in place all day and I only touched it up once. I loved how it gave my face a dewy, healthy glow it's definitely made me rethink how I'd like my makeup to look. I would definitely use this again on those days I know I will be wearing makeup for a long time, but I don't think I'd wear it every single day purely because I think it will make my skin more oily than good. Have you tried this balm out yet?? I tried it once and didn't feel the love for it but I've since heard it works better when you keep blending it into the skin until it becomes tacky so I'll have to give it another go! I really didn't expect to like it, tried it and it works just as good as my MAC primer! I definitely think it's an amazing product for keeping makeup on! I've heard this is good as a primer! I have somewhat dry skin so I hope if I try it I wouldn't experience some of the negative effects people with oily skin may get. Plus I'm always after a glow! It really is! I love how glowing it is on my skin I would definitely try it out and see how you get on! I hated this, I didn't mind how it made my makeup last but it's so heavily scented it broke me out like crazy into some really gross painful spots! It was gutted as so many people love it. My skin has broke out badly mind but I don't think it's linked to this, its such a shame though! You are welcome let me know if you ever try it out! I've tried this balm and loved it (so much it made the cut to my monthly favourites!). My skin is quite dry currently as it's winter here so my I didn't notice my skin being left oily, but maybe in summer it could be a different story. For now i'm wearing it every day cause it's fabulous. definitely give it a try and see what you think it isn't expensive either so if it doesn't work you won't feel bad!